After examining the other identities already covered this month, we can be assured that we are confident children of God. Paul writes in Ephesians, “In him and through faith in him we may approach God with freedom and confidence” (Ephesians 3:12 NIV). This means that not only do we have the freedom to approach God whenver, but also we have the confidence because we have put our trust in Him. According to The Baker Illustrated Bible Commentary, “This age-old, unanticipated plan he carried out in the person and work of Christ, Lord of the universe (3:11), in whom we have full confidence, by faith, to come freely and boldly into the presence of God (3:12).” By being in Christ, we do not need to fear; we have full confidence. Our confidence is also mentioned in the book of Romans, “And we know that in all things God works for the good of those who love him, who have been called according to his purpose” (Romans 8:28 NIV). You and I can be confident that God is working everything out for our good because we love Him. I am sure that as a Christian you have heard this verse several times. You might have even quoted it to someone who was facing a difficult situation. I encourage you to work on memorizing this verse, if you have not already done so. It has such power behind it. Let me ask you a question; do you believe the promise in Romans 8:28? It is one thing to say it, but it is quite another to live like we believe it. One reason why this may be difficult to believe is because the storms in your life may be so overwhelming. However, no matter what the situation is or how all encompassing it may seem, God is right there with you. He did not create everything and simply walk away. He is intimately involved in the details, both big and small, in each of our lives. Take a moment and think of the dark times in your life; how did God make Himself known to you? Another key point in this verse is the wording His purpose. Often we lose sight of this. We think everything needs to work out according to our purpose. Keep in mind that God has a greater purpose and plan for each one of us, and this gives us confidence to follow His lead in our lives. Sometimes, however, that means we have to go through the fire or trials of life. Think for a moment about a piece of steel. Alone it is worth only about five dollars. However, when it is shaped, hammered, and put through the fire to make springs for a watch, the value increases to hundreds of dollars. The same principle is true in our lives. Through this refining, God will shape and mold us into even more valuable individuals. Because God is powerful and loving, we can be confident that He will work out all the details in our life for good, according to His purpose. What a wonderful promise to rest upon. 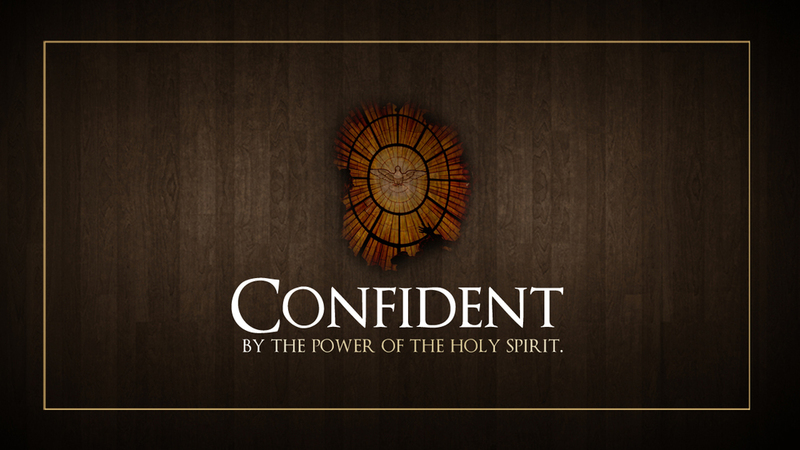 Keep in mind that we do not need to be confident in ourselves, but rather in Him. Ever since January when I became so close to death I lost my confidence, not only to myself but in God also. I thought that everything that God said to me came back void. To be Evangelist/Pastor was wrong. I actually thought that death my destiny and that there was nothing I could do to change it. I laid in the hospital waiting for one day I wouldn’t wake up. Everyday I did. I couldn’t understand it, cause I tried everything, till I realize I was depending on the wrong person. I had know power, couldn’t change nothing, didn’t have strength to do so either. And after reading this blog it seem like it was meant for me. My confidence needed to be on God and God alone. Hr saved me for His plan. That I need to put my full trust in Him and Him alone. Even though this is just the beginning of my recovery I NOW know that that my life, the air I breathe is controlled by God. And His plan will come into to place and I will soon know and understand what it may be. Thanks for sharing this blog it solo uplifted me and encourage me, helped me not to give up and lean on Him.